We are pleased to introduce ourselves as manufacturers and applicators of specially manufactured UGAM INSULMIX safety coating system for L P G installations. i. e. L P G BULLETS AND PIPELINES. We are providing the coatings for those installations as per safety norms and colour codes provided for those installations by I. S. NO 2379 YEAR 1990 for pipelines identification colour code. The colour shades are as per I S 5 YEAR 2004 for Colors for ready mixed paints and enamels. LPG installations are very sensitive and need to be taken well care off. Any negligence in it can cost life of many people and damage to the property of Cores of Rupees. The tanks become extremely cool in the lower half during conversion of liquid to vapors of petroleum gas due to endothermic reaction. When moisture in the air comes in contact with this surface, gets converted to water droplets and gets condensed over the tank surface. This causes heavy rusting of the surface. The upper half of the tank gets heated due to I R radiations in sunlight and the pressure in the tank starts rising. This rise in pressure leads to the danger to tank and line as well as use of extra gas than required for combustion. Also to avoid this we are using water sprinklers in summer in order to maintain the pressure in the tank. This is costing us heavily in terms of loss of water and increase in energy bills. There is heat leakage from the shell or joints of vaporizers. This leakage of heat will be minimized to reduce energy bills. To avoid rusting, increase the life of your LPG bullet/pipeline, increase the safety of the installation and most importantly to keep your energy bills low, we have brought UGAM INSULMIX COATING SYSTEM to your doorstep. This is the only coating system which will pay back it’s cost in terms of saving. Since energy conservation is motto of every industry, this system is a real must for every industry. Herewith we are attaching the photographs of the procedure of UGAM INSULMIX coating system, Job completed at BHARAT FORGE LTD., PUNE, testing done, FAQ’S about the system and the list of our regular clients for your reference. We will inspect the installation at your premises and submit the report along with the coating required and the quotation for the same. 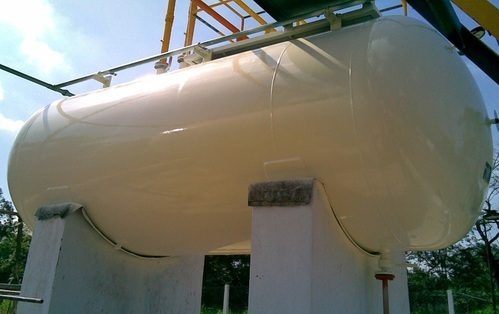 We feel that you will certainly be interested in the coating to be done to the tanks at your premises. But please do not hesitate to contact us in case of doubt. Excellent Product Exclusively Developed for LPG Bullets ! 1) LPG installations are very sensitive and need to be taken well care off. 2) Any negligence in it can cost life of many people and damage to the property of Crores of Rupees. 3) The tanks become extremely cool in the lower half during conversion of liquid to vapour of petroleum gas due to endothermic reaction. 4) When moisture in the air comes in contact with this surface, gets converted to water droplets and gets condensed over the tank surface. 5) This causes heavy rusting of the surface. 6) The upper half of the tank gets heated due to I R radiations in sunlight and the pressure in the tank starts rising. 7) This rise in pressure leads to the danger to tank and line as well as use of extra gas than required for combustion. 8) Also to avoid this we are using water sprinklers in summer in order to maintain the pressure in the tank. 9) This is costing us heavily in terms of loss of water and increase in energy bills. There is heat leakage from the shell or joints of vapourisers. 10) This leakage of heat will be minimized to reduce energy bills. Looking for “LPG Bullets Coating”?